On Sunday, November 3, 2013, the Houston Texans played an NFL home game against the Indianapolis Colts, which began relatively uneventfully. However, it became clear that the game would not proceed in a typical manner as millions of viewers observed live footage of Texans head coach Gary Kubiak, 52, collapse on the field while exiting to the locker room at halftime. I am a vascular neurologist, a neurologist who has completed additional fellowship training in order to specialize in the treatment and prevention of stroke. Since completing my stroke fellowship in 2010, I have had the great privilege of caring for many patients just like Gary Kubiak, adults on the relatively young side who never expect such an event to disrupt their lives. The unfortunate reality is that stroke can happen at any age and can affect anyone. A stroke is a stroke. Period. A stroke results in an injury to the brain. There are two basic types of strokes – ischemic and hemorrhagic. An ischemic stroke occurs when blood cannot reach part of the brain for a prolonged period of time and permanent damage to brain tissue takes place. A hemorrhagic stroke occurs when a blood vessel ruptures and bleeding occurs within the brain. Roughly 80% of strokes are of the ischemic type. A transient ischemic attack, or TIA, occurs when blood flow is disrupted to the brain and symptoms concerning for stroke occur, but then blood flow is either restored or the brain compensates for the absence of blood flow by seeking and acquiring blood from other sources and no damage to the brain occurs. During a stroke, brain damage occurs. During a TIA, damage does not occur. What about a TIA during which damage does occur? What is that called? The answer is – a stroke. To describe a TIA as a “mini-stroke” misses the difference between the two terms. A TIA is not a stroke because damage is avoided. A stroke is not a TIA because brain damage has occurred. I like to refer to a TIA as an almost-stroke as opposed to a mini-stroke. Throughout the lifetime of this blog, I will continuously refer to TIAs as almost-strokes. Sometimes patients may refer to a stroke with relatively mild deficits as a “mini-stroke” to distinguish it from a stroke that leaves someone externally and obviously disabled. This is also inaccurate. I have seen patients without a single physical visible deficit from a stroke who are significantly disabled from the cognitive impairment that frequently occurs following a brain injury. I have cared for a patient for the past two years whose only symptom from her “mini-stroke” (the term she used at her first appointment with me) was a left-sided neglect syndrome. This occurs when the brain fails to recognize that the left side of the body exists, even though the left arm and leg may move appropriately and strength on the left side can be left fully intact. She was a successfully employed person prior to her stroke in her 50s, and she has not been able to work since her stroke. She does not factor in columns on the left half of the screen when working with spreadsheets because her brain fails to recognize the left half of her conceptual world. She neglects to brush the left side of her hair and has tooth decay in the left side of her mouth because she does not brush her teeth on that side. She cannot drive because she visually neglects cars that appear in the left half of her world, even though her vision on the left side is intact. Is this really a mini-stroke? In the initial evaluation of a stroke patient, this graphic is presented in order to calculate a score known as the National Institutes of Health Stroke Scale Score (NIHSS Score). The examiner asks the patient to describe what is seen in the picture as a test of language fluency. 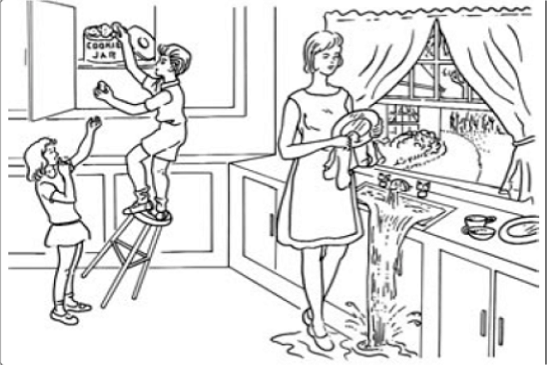 However, patients with profound left visual neglect will describe the woman washing dishes at the sink, but will fail to recognize the children in the left half of the scene. Perhaps the other reason why I prefer to avoid the modifier “mini” in front of a word as significant as “stroke” is because patients tend to downplay the importance of the event. I love caring for patients after TIAs, because the damage has not yet occurred, and we can intervene to prevent a stroke! If a patient has a TIA and refers to it as “mini,” then I find there is less motivation for the person to quit smoking, comply with therapy, eat healthily, or exercise regularly. After all, it was only a mini-stroke. The other piece to these headlines is the relatively young age of the Texas coach. I definitely see patients at 52 with accelerated atherosclerosis (plaque buildup in the blood vessels, or “hardening of the arteries”), high blood pressure, diabetes, elevated cholesterol levels – some of the more typical stroke risk factors seen in older adults. However, it brings to light that a person is never too young to have a stroke, and more awareness hopefully will result in a call to 911 when stroke symptoms develop as opposed to taking a nap in an effort to sleep it off. Young people frequently do not believe their symptoms might represent a stroke, and choose to rest in hopes that the episode will resolve spontaneously. When they awaken, often there are no interventional options available, and therapy shifts from acute treatment of the current stroke to rehabilitating more long lasting deficits and focusing on how to prevent the next stroke. During my stroke fellowship at the University of Washington/Harborview Medical Center in Seattle, I experienced my first encounter with stroke in the truly young patient. Samantha (not her actual name) was 16 years old when she developed weakness on the right side of her body and was diagnosed with an ischemic stroke based on her Magnetic Resonance Imaging (MRI) of her brain. Her physician recommended that she start taking aspirin daily, a medicine that assists in “preventing platelets from sticking to plaque in the blood vessel wall and from sticking to one another.” I put this phrase in quotes because I use it often when explaining why healthcare providers use aspirin for the prevention of strokes and heart attacks. While Samantha took her aspirin compliantly, she had a second stroke. Clopidogrel (trade name: Plavix) was added to her daily medication regimen. Take what I said aspirin does, and for most people, the effect is essentially more robust with clopidogrel. Biological warfare had essentially been declared on Samantha’s platelets. She was also started on a statin, a class of medications to lower cholesterol and to protect blood vessels from accumulating plaque, or to protect against “hardening of the arteries.” Surely she was not going to have another stroke. But she did. This is when I had the privilege of meeting Samantha. My stroke fellowship had just begun, and in my first weeks I encountered this young girl and her frightened mother. I did not know where to start, and I remembered words from mentors throughout medical school and my neurology residency training: Ninety percent of the relevant information for solving a medical mystery is in the history, or what the patient tells us. The rest of it – lab tests, radiology studies, you name it – confirms or denies a healthcare provider’s assessment of what the patient has described. Essentially, if the patient is describing symptoms of a stroke – weakness on one side of the body, drooping of the face, slurred speech – then my tests are to confirm or deny my suspicion. This is why taking the time to listen to patients is critical in providing care. When Samantha recounted the stories of each stroke, there seemed to be a strong headache element. Headaches can occur with strokes, but many strokes are painless, and it seemed important that she would remember headaches while experiencing stroke symptoms. Not infrequently patients with strokes do not immediately recall a headache, because they are so alarmed by the weakness, numbness, or slurred speech that they forget to tell their physicians about the headache. Samantha began her tale of her first stroke with details about a headache. My fellowship mentor and I decided that her strokes probably did not stem from platelets, blood clots, or plaque accumulation in her blood vessels. She was 16 years old, so how much plaque could she possibly have accumulated at that point in her young life? We determined that her strokes may have resulted from blood vessels constricting, or spasm/squeezing, as part of a newly described syndrome called Reversible Cerebrovascular Vasoconstriction Syndrome. In order to formally make the diagnosis a patient should undergo imaging of the blood vessels during an episode to demonstrate narrowing and constricting, and then repeat this imaging later to show that the constriction was reversible. We did not have this opportunity with Samantha as the episode was completed by the time we evaluated her, but we did decide to empirically start her on verapamil, a medication that can assist blood vessels with relaxation. The thought is that it can help to prevent constriction of the arteries. Magnetic Resonance Imaging (MRI) of the brain of a young stroke patient with Reversible Cerebrovascular Vasoconstriction Syndrome. The bright areas are regions where blood flow has been recently disrupted as a result of arteries constricting. Samantha did not have another stroke. We stopped her statin for cholesterol control, and we stopped her clopidogrel as antiplatelet therapy. Off of these two medications, she did not start having strokes again. I continued seeing her in the stroke clinic throughout my fellowship year, and she did very well in her recovery. I recently reconnected with her, and since that time she has had a healthy baby without stroke complicating her pregnancy. The valuable lesson I learned from Samantha is that the young stroke patient is an entity of its own. Because many strokes in the general population stem from plaque accumulation and platelets adhering to it, stroke patients end up on medications that prevent platelets from functioning and on statins to prevent plaque buildup. In many cases, this is a correct, evidence-based course of action. But a 16 year old is not a typical stroke patient, and the origin of her stroke was not going to be typical either. When a young celebrity has a stroke, it makes the national news, and there is dialogue for a few days about how surprising it is that someone so young could have a stroke: Bret Michaels, 47 at the time of his stroke; Frankie Muniz, 26 at the time of his “mini-stroke” (TIA). While gone from recent memory, Curly Howard of The Three Stooges fame died from complications of a stroke at the age of 48. Jean-Dominique Bauby, the editor of the French magazine Elle, sustained a severe stroke at the age of 43, resulting in locked-in syndrome, a phenomenon I will examine in a future blog post. Bauby “dictated” his memoir, The Diving Bell and the Butterfly, by blinking his left eye when his associate, Claude Mendibil, would speak the desired character after verbally scanning through the alphabet, starting with letters most frequently used in the French language for more optimal efficiency. In my own practice, it seems like every week I evaluate someone who had sustained a stroke under the age of 50. The cumulative sum of patients in this population increases with each passing month, and in 2011, after practicing for one year following my stroke fellowship, I noticed that most of the young stroke patients seemed to experience similar issues that created significant stress in their lives. To start, young stroke patients spoke of feeling alone in their struggles because the people they knew with strokes were older, and thus they found it difficult to relate to the experiences of other stroke patients. These patients found their strokes to be financially stressful, as they typically were working full time prior to their events, and had not yet invested enough for retirement. One of the challenging questions frequently was whether to try to return to work for badly needed income despite deficits in functioning, or whether to apply for disability, knowing the amount would be substantially less than these patients were used to earning. Some of these patients had just become parents within the past several years, and others found that their relationships with their spouses had changed after stroke. One complaint I hear recurrently is the frustration young stroke patients feel when they are told: “You don’t look like you’ve had a stroke.” They feel an expectation to perform at their pre-stroke levels and to return to normalcy, but many feel forever changed in some way. It became clear that these patients needed a support group, and we launched the Young Stroke Survivor Support Group in May (Stroke Awareness Month) 2012 at our neurology clinic in Charlotte, North Carolina. There is interest in stroke and how it can affect younger people, but there are few resources for this patient group. The Stroke Blog will tell the tales, with the blessings of the patients, of some of the young individuals affected by stroke who have entrusted me with their care. When a stroke appears in the mainstream media, I will attempt to break it down in an understandable way for readers here. While I probably will not be able to answer all of the questions that are sent my way, I will select questions that yield the opportunity for education and dialogue with the hope that greater understanding of stroke will come for my readers and will write about suggested topics. I will be unable to offer specific medical advice through the blog, though, and also kindly ask that if someone is experiencing concerning symptoms (weakness, numbness, visual loss, headaches, trouble speaking, etc.) that 911 be called as opposed to submitting a blog comment! It is worth noting that approximately 25-30% of strokes, even after an extensive diagnostic workup, remain “cryptogenic” – that is, a flowery medical term for “we don’t know why this happened.” In these cases, I remain true to the principle that what the patient tells the physician is ninety percent of the answer. Then, I make the best decision I feel I can make, knowing that some things remain unknown, and regardless of what we may desire, tomorrow is not guaranteed to any of us. Young stroke patients have taught me more than I can possibly recount about humility, despair that transitions to optimism and hope, enduring love between partners, strength, determination, and how to keep going. I sincerely hope that you will find The Stroke Blog useful, and I look forward to the journey. Dr. Dodds, more vascular neurologists, and MDs (and other medical specialists)whose expertise is directly related to strokes, would do a world of good by writing to patients (and their caretakers or “health allies”) who have had strokes or “almost strokes”. Like many other stroke survivors, I found myself facing a healthcare little structured to systematically address the myriad problems we have faced. I was and am fortunate inasmuch as I have many family members and friends to help me navigate the path I have been on since the massive hemorrhagic stroke I had September 6, 2008. Today MDs, nurses, therapists, healthcare administrators, et al., each facing a welter of responsibilities, rarely if ever have the capacity to help the patient develop a strategic, informed plan to get as healthy as possible. Hello there. I had my first stroke at 35 and second at 38. I eventually came to the conclusion that it was related to my migraine…which sounds very similar to the Reversible Cerbrovascular Vasoconstriction Syndrome–I follow a lot of information on Hemiplegic Migraine as that is the closest I have found. Treated with Varapamil too. My migraines are fairly well controlled at this point but I always FEAR another stroke. Appreciate your blog! Look forward to learning more. I am a 47 yr old female without cholesterol issues, was exercising regularly and was taking 10mg of Lisinopril for HBP. I had both a hemorrhagic and ischemic stroke, as well as being diagnosed with RCVS in June 2013. I was hospitalized/diagnosed at University Hospital in Salt Lake. While I was treated with Verapamil, my RCVS did NOT alleviate completely and migraines are constant. I have not found another person who has also had RCVS and lived. The cause of it is “cryptogenic” as I neither drink nor am a drug user. Thunderclap headache was the FIRST symptom. Second, I felt the bleed happen as if a valve opened in my head and hot lava poured into my brain. Within a half hour, the pain was intense with every heartbeat. I prefer to NOT experience this EVER again. My neurologists here in MT and in Salt Lake are not familiar with RCVS, the treatment, issues or its long term outcomes. I hope you have some insight or address this in the future. I am 43 and also recently diagnosed as RCVS although I am questioning that after reading of vascular conditions it could possibly be. I have autoimmune diseases of hashimoto and psoriasis as well as immune responses of inflammation yet no diagnosis of any other immune disease when this occurred. I also have no findings labelled spontaneous and this stemmed over several months had to nag dr over vision disturbance before sent to neurologist who saw it after 4 scans. I am on verapamil but still having mild TIA like symptoms that only last briefly such as everything goes black and about to pass out but as suddenly as it starts within second stops. very frightening feeling to about to loose consciousness. also tingling down arm stopped on verapamil but comes suddenly and fades still – vision in left eye still has issue although eye exams show no visual explanation. I am going to see a specialist to look at possible damage of flow to eye with the spasms they saw in few weeks as the blurred vision remains. Also my headache was not sudden and worst of my life like rcvs symptom its a constant dull ache in temples and random severe thudding in primarily left temple that lasts only a few seconds then stops reappears a few times few moments between bad enough to grab side of head and then stops all together. I am interested to know where you were located for your diagnosis and if your care team has any long term prognosis’ for you? Also, what is your dosage for Verapimil? I saw the outcomes of my cranial imaging and the before/after effects of treatment and also the remaining areas of constricture and have no doubts of my correct diagnosis. I was told that I am on Verapimil for life, but have no idea if the dosage is static or needs to change at any point or if I need followup testing to determine if the dosage is appropriate and if my RCVS remains stable. Waiting for another stroke to prove seems risky. My neurologists simply said to “Go live life” and that they had no clear idea of treatment, outcomes or long term prognosis. I, too, suffer nearly constant migraines, and also have vision difficulties for which I am trying to overcome through OT. I had exams from the neuro-opthamalogist that were “normal” but through OT we know I have deficits in sight and response to movements/identifying moving objects and depth perception. I have also developed, since the stroke, arthritic type aches and symptoms in my hips (moderately severe), knees (mild) and shoulders (moderate) that leave me with pain enough to wake me from sleep. My neurologist says she has no explanation/treatment for this. Frustration, scary and the unknown are all words I now live with. Yes, I was also told by the team in Salt Lake City, at the Neuorology Center, that I am also an “unknown” and that I was a very interesting case and IT IS NEVER GOOD to be the interesting case. And they shrugged at my long term care, prognosis and cause. I am on Verapimil 120 mg once daily. I had two cranial angiograms, the second 3 months after my stroke and treatment began. It showed that the majority of the vasoconstriction throughout the left hemisphere was better EXCEPT one area, which seemed unchanged. He said this would now be my NEW NORMAL. I suffer from constant migraines and have been on 200MG daily of Topirimate until I began acupuncture recently. I have found relief with that. I was told to NOT drink alcohol, ingest caffeine, Tylenol, NSAIDS or any other med that might cause a reaction to the brain. For life. All of the team there and here in MT agree that alternative medicine is my best avenue and are on board with massage, meditation and acupuncture for treatment. My vision has improved but not well enough to drive, my hearing is better but tinnitus is an issue, have short term memory issues, Aphasia and fatigue. I wish there was more out there about RCVS. You are the only other person I’ve found, in my massive search online, that has also experienced this. We were told by SLC team that most people just die from it. I agree the most frustrating and scary aspect is being told unknown reason and also no known treatment except verapamil has shown some improvement in rcvs so here take it… My neurologist brushed it off as it’s reversible here take the med see you in a few months. Meanwhile I’ve had chest heaviness and lingering symptoms. Have you ever had any immune issues or inflammation ? I’m convinced my autoimmune issues and crp levels played a role but there is no research I’ve seen that would shed light on that. I have had steady mild headache ever since it began and occasional severe thudding in temple mostly left although a few times in right side which is different and makes me nervous. I’ve recent been having nausea and lightheadedness with the sudden short throbbing pains which is new. At first I would call dr when i was having the slurred speech or other symptom. Now I’m figuring this is how it is going to be. They seem to think verapamil will make it all stop in several months, I hope she’s right 🙂 in regards to the alternative care I have worked with a functional physician and a functional nutritionist. I was on strict no gluten no sugar no dairy no yeast diet. It helped tremendously with some stuff especially inflammation. There is an aip support on FB if you are interested in trying clean diet to help with headache. I had a Verapimil dosage during my first cranial angiogram and it visibly corrected some areas of the vasoconstriction–not all–so we know it did work. At my three-months-later angiogram all areas of constriction were better with the exception of one. THAT is the area he considers my new normal–and he said the Verapimil is for future prevention but would probably not “cure” that final area. I have no known autoimmune issues though since the stroke I have developed those body aches and the arthritis in the spine has certainly worsened as well as developed in the hips/pelvis. I am in PT for that. I was tested for RA and my numbers showed no inflammation at that time. I do take Levothyroxine as well, for my hypothyroidism. I could certainly watch better my intake of foods that are known triggers for inflammation but have not at this point. About the headache–I, too, have had steady low grade headache since then with periods of severe headache and like you, only on the left side (the side with the constriction). I also had a subdural hematoma and I know with certainty (since I felt the moment the bleed began like a valve had opened in my brain and hot lava flowed in) that area continues to plague me. If I could flip my head open I could place my finger on that area EXACTLY, as many times that is where I again feel debilitating pain. I also suffer vision difficulties and extreme tinnitus when the headaches are worse. Acupuncture has helped, as does meditation and massage but I know that I will probably never be completely free from any of the above. I know through OT for my eyes that my brain and eyes don’t communicate, my eyes don’t focus and had also become “lazy” because of this. It may contribute to my headaches and I am again having my eyes examined in December. I am 17 months in from my strokes. When was yours? Dr said she saw no damage from the vasoconstriction in follow up MRA but I did have right sided numbness especially arm into hand that lasted for several weeks before fading and the vision in left eye has not improved. It’s as if someone coated eye with vasoline is only way to describe it and my perepheral view is not good. I see the neuro opthamologist next week to see if I suffered some type of damage to eye. I had been complaining to dr about symptoms and assumed it was my hypothyroidism(hashimoto) and immune issue. He had neuro consult done to rule out ms and they found the spasms so I figure I was lucky I was persistent and caught early. stroke. She was 11 years old!! Sounds like her case was “cryptogenic” as after all tests nothing showed up and thankfully she has made very good progress with her rehabilitation and nothing else happened! The neuro pediatrician diagnosed it as a “mini stroke” only to realise after the MRI that in fact it had been “quite a big event”!! Any doctor would certainly be more careful before diagnosing the extension of a stroke? We found this very insensitive and had another specialist looking after our daughter who spent 11 weeks in hospital. As a mother and carer I feel there is still a long way to go regarding services specifically developed to deal with stroke effects in children. We live in the UK. I joined a childhood stroke support group where we try and support each other wherever possible and your blog also sounds interesting to follow. Do all strokes show up clearly on MRI? @Patty – The answer is no, all strokes do not clearly show up on MRI. MRI is a very sensitive tool for evaluating even very early ischemia (inadequate blood flow) to the cerebral hemispheres of the brain, but there are times a very early or very small stroke may not be evident on an MRI. Likewise, small strokes in the brainstem and cerebellum may not appear on MRI. I have seen cases where an initial MRI is normal, but repeating it several days later finally reveals the small brainstem stroke that escaped notice on the first study. However, MRI is a much more reliable tool for identifying early stroke than a CT scan is. A CT scan has fairly good sensitivity for identifying blood in the brain (about 92% sensitivity). In a future post, I will elaborate on the imperfection within diagnostic medical tests. Thanks to everyone for their comments, email, Facebook feedback – the blog is less than a week old at this point, and the amount of dialogue has been tremendous. Keep it coming! Great blog thankyou. I will keep connected. I currently have a 16 year old very fit bright female pt who suffered a left temporal parietal hemorrhagic stroke thought to be caused by her contraceptive pill. She is recovering well just some mild speed of information processing and word finding difficulties. But socially her biggest difficulty is, as you described, that people say you are too young or you don’t look like you’ve had a stroke. Thankfully her family and school are very supportive and accommodating. We are now working in managing her stress levels due to some frustration as she paces her return to school and elite sports participation. On June 4 2015 I found my husband around 7:30 in the morning in bed not responding to me. He was breathing. There was dried blood on his chest. I called 911 and he was air cared to UC hospital. He was 57 and had his own heating and cooling business. Doctors said he had anurizm and several mini strokes in brain stem area. He put a coil in the blood vessel and spent 4 weeks in NSICU. Then another 4 weeks in the hospital. He had smoked since he was 13 years old. He did not have any health issues that we knew of. After 8 weeks in hospital he was moved to a nursing home. Had a feeding tube could only say a word here and there. Right side was weak and couldn’t use it. It has now been 14 months. Feeding tube out and feeding himself. Walking with the help of a walker. His bathroom fictions can’t be controlled . His short term memory is bad. He can’t remember what he had for breakfast after 2 hours of eating. His long term memory is very good. He can read and write. My question is how possible is it for his short term memory to get better at this stage of the game. Also his bathroom problems.